When you get an invoice in the mail, your first inclination is that it needs to be paid—especially an invoice as important as your web domain listings. However, if you act too fast, you may be victimized by con artists. There are new solicitations going around that look like invoices. 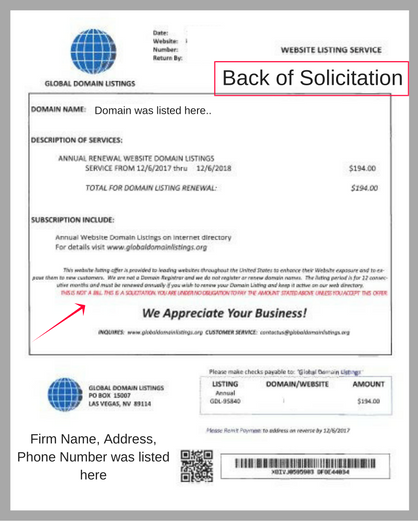 You think you are being billed for the web domain you already have, but in fact, the invoice is actually a solicitation from a different provider. One of our clients experienced this firsthand. Your web domain and listings are usually annual expenses that get reviewed once a year for your annual bill. As long as there are no problems throughout the year, it’s easy to forget about the companies you are registered with. If you are unsure of the nature of the invoice, withhold payment until you can contact the company and verify that they are your provider. Solicitations of this type are illegal unless they have specific features. A disclaimer in very large (at least 30-point) type. Text in boldface capital letters. Font color that contrasts prominently with the background against which it appears. Would you move forward with paying this invoice if you received it in the mail? Global Domain Listings, the subscription includes annual website domain listings on internet directory by www.globaldomainlistings.org. This website listing offer is provided to leading websites throughout the United States to enhance their website exposure and to expose them to new customers. The listing period is for 12 consecutive months and must be renewed annually if you wish to renew your domain listing and keep it active on our web directory. This is not a bill. This is a solicitation you are under no obligation to pay the amount stated above unless you accept this offer. 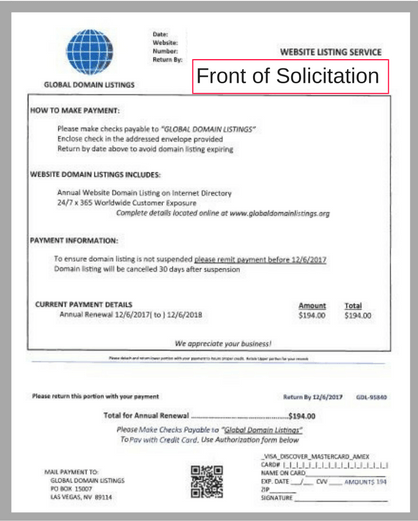 Please make checks payable to Global Domain Listings. To ensure domain listing is not suspended please remit payment. If you have received a questionable invoice, contact the company right away. If it is, in fact, a real invoice, you don’t want to be late on the payment. Failing to pay your web domain service could result in your website being taken down and users being shown a broken page. This can cause your business a lot of harm. Check your records to confirm your domain host company and keep accurate records. The best way to keep invoices straight and to pay them promptly is to channel everything to one employee in one department. If you believe you have received an illegal solicitation, please contact the U.S. Postal Service so it can place a stop on the mailings and return them to the sender. Standing up to these criminals will cut the source of their revenue and hopefully dissolve their solicitation efforts. Holly, I'm so happy you had the right team set up to take care of that solicitation. Good catch! We received a letter like this at our firm and I am so glad we read it carefully! Our accounting team was quick to question it when the company did not seem familiar.